House Democrats barely had a chance to celebrate the new majority they won on Tuesday before Donald Trump confronted them with their first test. Hours after warning Democrats of retaliation if they harassed him with congressional investigations, the president ousted Attorney General Jeff Sessions and replaced him with a loyalist who had criticized the probe that has placed Trump in legal jeopardy. And so, a day after voters elected them to serve as a check on the Republican president, Democrats responded swiftly by marshaling the full force of their power: They fired off a few strongly worded letters. Specifically, Democrats insisted that Republicans hold emergency hearings on Sessions’s firing, and they wrote to the White House demanding that officials there preserve all records having to do with Trump’s decision to replace him on an acting basis with the departed attorney general’s chief of staff, Matthew Whitaker. Their fear is that the shakeup is a prelude to a move by the president to end or severely curtail Special Counsel Robert Mueller’s investigation—from which Sessions had recused himself—into whether the Trump campaign colluded with the Russians during the 2016 election and whether the president himself obstructed justice by trying to shut down the FBI’s initial inquiry. Trump has railed against the probe as a “witch hunt” and pointedly refused to pledge that he would not shut it down. “I could fire everybody right now,” he told reporters on Wednesday. Democrats quickly called for Whitaker to follow his old boss’s lead and recuse himself from overseeing the Mueller probe—a step Whitaker reportedly has no intention of taking. “It’s basically a constitutional crime scene, and we want to try to rope it off with yellow tape as quickly as possible,” Representative Jamie Raskin of Maryland, a constitutional scholar who serves on both the House judiciary and oversight committees, told me in a phone interview on Thursday. Yet writing letters and making requests is about all the Democrats can do right now. As a practical matter, they won’t actually hold the House majority until January. At that point, they could back up their demands with the authority to subpoena records and testimony from officials at the White House or the Department of Justice. But even then, it’s unclear whether Democrats would be able to force the president’s hand or ensure that Mueller’s investigation—if it doesn’t conclude in the next two months—could proceed unimpeded. Raskin told me that lawmakers are actively looking into whether Trump violated the Constitution by appointing someone to serve as acting attorney general who has not been confirmed to a high-ranking post by the Senate. “You can’t appoint people to be principal officers of the United States without Senate action,” he said, using the phrase in the Constitution that refers to what are now called Cabinet members. “That’s the question anyway.” In an op-ed published in The New York Times on Thursday, Neal Katyal, a former acting solicitor general in the Obama administration, and George Conway III, the husband of Trump adviser Kellyanne Conway, argued that the president’s appointment of Whitaker was unconstitutional. Once Democrats assume power in the House, Raskin said, they could vote to initiate a lawsuit challenging actions taken by Whitaker on the grounds that his appointment was unconstitutional. House Republicans used a similar legal tactic against former President Barack Obama to argue that he exceeded his power in the implementation of the Affordable Care Act and when he unilaterally chose to grant protections from deportation to undocumented immigrants. Whether such a lawsuit would go anywhere is another question. Tara Leigh Grove, a professor at the William & Mary Law School, has argued that institutions like the House of Representatives do not have standing to sue the president over claims of constitutional violations. But, she said in an interview, there is a vigorous ongoing debate in the legal community over this question. “It’s a really tricky area because there's very little Supreme Court precedent,” Grove told me on Thursday. In bringing cases against the Obama administration, lawyers for the Republican-controlled House argued that one or both chambers of Congress could sue the executive branch on the grounds that actions that exceeded presidential authority infringed on powers reserved for the legislature in the Constitution. But, Grove wrote in her paper, it is individuals who are directly affected, not institutions like Congress, who are offered the right to sue when constitutional violations occur. Come January, Democrats could also try to shield Mueller using legislation. 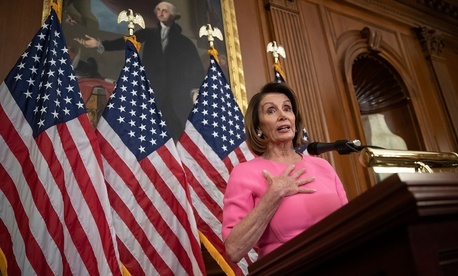 On Thursday afternoon, House Minority Leader Nancy Pelosi convened a conference call of Democrats to discuss how they might respond. In a statement a day earlier, she renewed her call for including language protecting the special counsel’s investigation as part of a spending bill Congress must pass in the lame-duck session this fall. The Senate Judiciary Committee adopted such a measure earlier this year, but it hasn’t come up for a full vote in either chamber. If she becomes speaker again in January, Pelosi could bring the bill up for a vote, but it would need a two-thirds majority in both the House and the GOP-controlled Senate to overcome a possible Trump veto. Judging by Trump’s posture at his post-election news conference on Wednesday, that hope may be wishful thinking. He suggested he would refuse to turn over his tax returns even if House Democrats subpoenaed them in an effort to find out whether he had foreign income that could constitute a conflict of interest in his dealings as president with U.S. adversaries like Russia. And he threatened Democrats bent on using their new power to investigate him with retaliatory investigations by his Republican allies in the Senate. “They can play that game, but we can play it better,” Trump warned. For the remainder of the year, Democrats will be where they were for the last two years—in the minority and reliant on Republicans to stand their ground against the president’s excesses. Senators Susan Collins of Maine, Ben Sasse of Nebraska, and Jeff Flake of Arizona all issued statements of support for the Mueller investigation on Wednesday, and Senate Majority Leader Mitch McConnell told a local station in Kentucky that he didn’t see “any chance” that Trump would halt Mueller’s probe before it could be completed on its own. But Republicans in the House have thus far ignored the Democratic requests for hearings when Congress returns next week. The back-and-forth over Sessions and Whitaker is sure to be the first of many skirmishes between Trump and the newly christened Democratic majority in the House. They have vowed to hold the president accountable, and to use whatever power they have to ensure he follows the rule of law. At the same time, the party leadership appears to be in no hurry to escalate the confrontation into what some of Trump’s fiercest critics see as an inevitable climax: impeachment. Pelosi has repeatedly downplayed the possibility, and the incoming chairman of the House Judiciary Committee, Representative Jerrold Nadler, set a high bar for its use when I interviewed him this past summer. The Democrats’ preference is to move deliberately—to hold hearings before issuing subpoenas once they get the gavel in January, and to wait for Mueller to issue a report before determining what action, if any, to take against the president. But the ever-impatient Trump, it seems, is eager to confront the new foil of a Democratic House majority. And by ousting Sessions and installing Whitaker now, he’s making moves while the Democrats are still powerless to try and stop him.